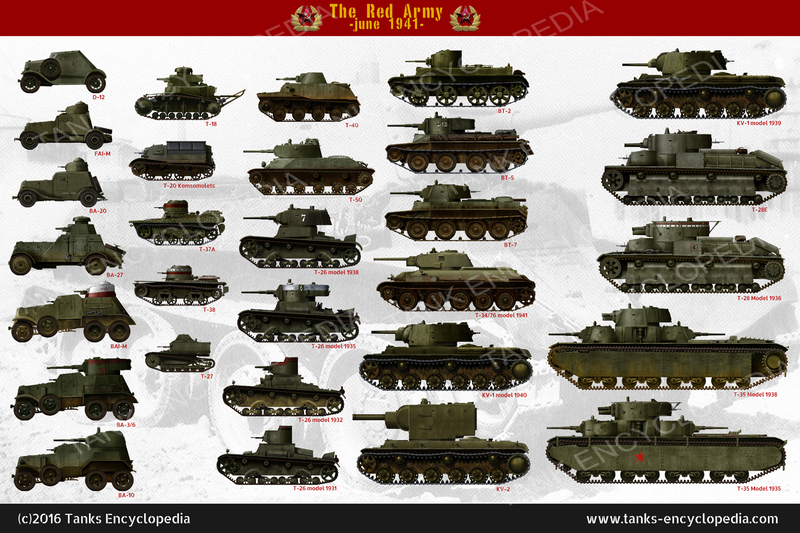 The T-12 and the T-24 were attempts to improve the line of Soviet tanks deriving from MS (T-18) tanks, mostly consisting of failed prototypes such as the T-19, T-21, and T-23. On paper, it seemed like a good idea, seeing as though the Soviets had no medium tanks during the design phase of the T-12 and T-24, between 1925-1931. Whilst the tank as a whole seemed to be a sound design, it was simply unworkable and mechanical failures were common. These failures may not have derived from the design itself, but from the fact that the USSR had very limited number of skilled tank workers and resources. The T-24 is the model which was cleared for production and had 25 built. Having said this, the T-12/T-24 project was in direct competition with the somewhat infamous Tank Grotte-1, which later met the same fate as the T-12/T-24 project. 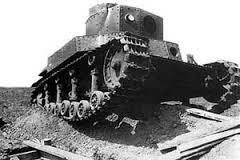 Development of this project and the TG heavy tank project was ended in 1931 in light of adopting production of the Christie tanks, more commonly known as the BT series. The T-24 tank. The commander’s cupola is very distinctive. The Soviets knew that they needed a more heavily armored tank than the T-18, but were actually not willing to embark on any such project until they felt that they had sufficient tank designing experience. A tank design bureau was established at the Kharkov Locomotive Factory (KhPZ), Ukrainian SSR in 1928. It was headed by I. Aleksienko in cooperation with A. Morozov, the man who would be in charge of all Soviet medium tank projects from 1940-1970. 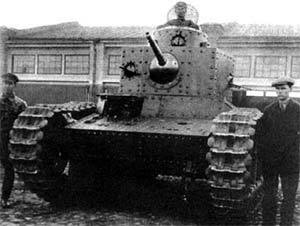 The first tank project of the factory was the T-12 (or T-1-12). 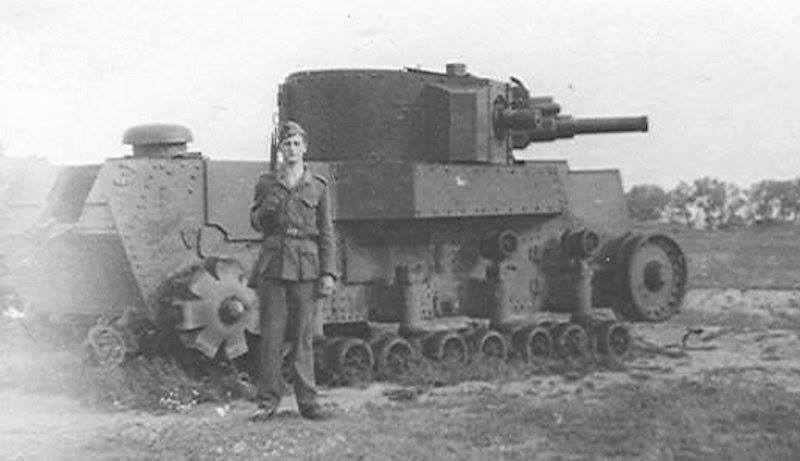 This was a larger version of the T-18 (or MS-1), with a more powerful 200 hp engine and bigger 45 mm (1.77 in) gun. The 1930 budget had funds for 30 T-12s. 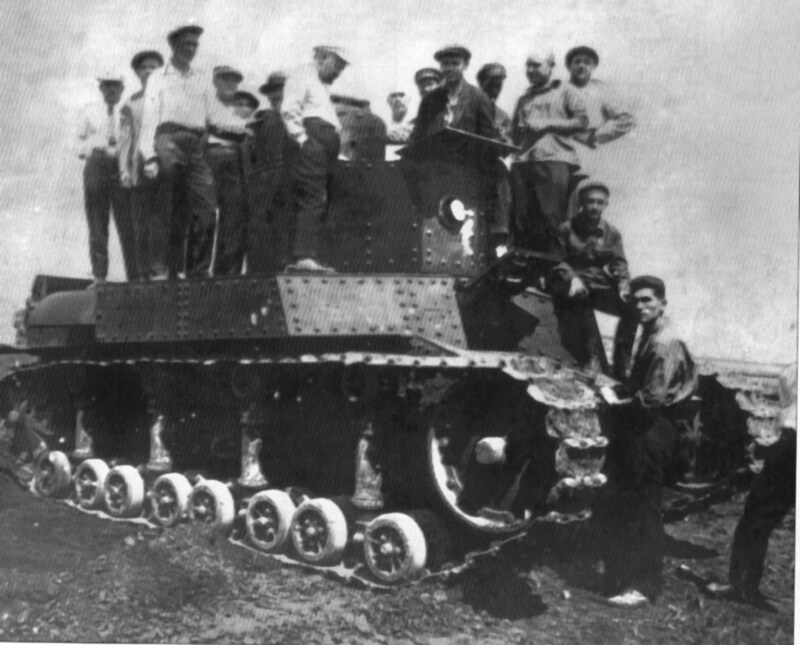 The concept of the T-12 consisted of a synthesis of the experience gained during the design and mass production of the T-18, and the idea of a multi-tier deployment of weapons, which was consistently tested by American engineers in the design of prototypes of a medium tank – the M1 Medium (models 1921 – 1925). The T-12 had a simple hull structure between two tracks with small-bogie suspension. It had a eight-sided turret with a rounded commander’s cupola and a crew of four. It weighed 19 tons, was 7.5 m long, 3 m wide, and 2.8 m high. It was armed with a typical Model 32 45 mm (1.77 in) gun, with space for 100 rounds, and it even had three 7.62mm DT machine guns in a Fedorov-Ivanov ball mount – one in the commander’s cupola, one next to the main gun, and one on the side of the tank’s turret. Like all Soviet tanks of that time, the T-12 had a removable “tail”, which increased the length of the hull by 690 mm, and gave the opportunity to overcome the trenches up to a width of 2.65 meters. Building this prototype reportedly took place in absence of high-quality materials, special equipment and skilled personnel. Despite this, assembly of the prototype took place at record pace, and the tank was collected for testing on October 15, 1929. To reduce the cost and time spent on the tank, the armored hull and turret were made from steel more suitable for construction, not armor. During trials, the T-12 prototype was revealed to be flawed and it was decided that a new design was needed. The project was re-designated T-24, work was completed fixing problems with the transmission and fuel system, and a larger turret was designed. Externally, the new tank was significantly different from its predecessor. The hull was widened to overlap the tracks and the superstructure had a V-shaped front with the driver at the apex, instead of a flat front. The turret was rather roomy (a luxury by Soviet standards), and had a similar commander’s cupola, which now had a slightly taller hatch with a hinged lid, which enabled the commander (without leaving the machine-gun tower) to observe terrain, and guide the actions of the tank. It also featured a rounded turret, whereas the T-12 had an eight-sided turret – they looked very similar, however. Another major difference is that the tracks on the T-12 were taller and there is less armor above them, as well as the front wheel being smaller. The T-24 also had a fourth DT machine gun in the hull instead of the flat space next to the driver’s hatch. Hatches on the tank were also changed a lot, especially the engine deck which was now accessible by two hatches, instead of four on top. Finally, it had an exhaust removed, so now it only had one. These differences are much clearer seen on their technical drawings. The tank’s cupola was made from sheets of metal ranging from 12-22 mm (0.47-0.87 in) thick, and was riveted together. 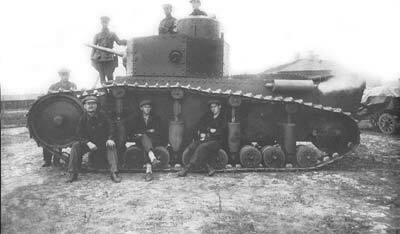 This tank only had a crew of 3, and was given the same 45 mm (1.77 in) gun, with four DT machine guns as well. Maximum armour was 25.2 mm (1 in), which was hardly noteworthy. It weighed 18.2 tonnes, which could be considered heavy despite the relatively thin armor. Its maximum speed was 24 km/h (15 mph), which was also deemed slightly unsatisfactory, given Soviet deep battle doctrines. 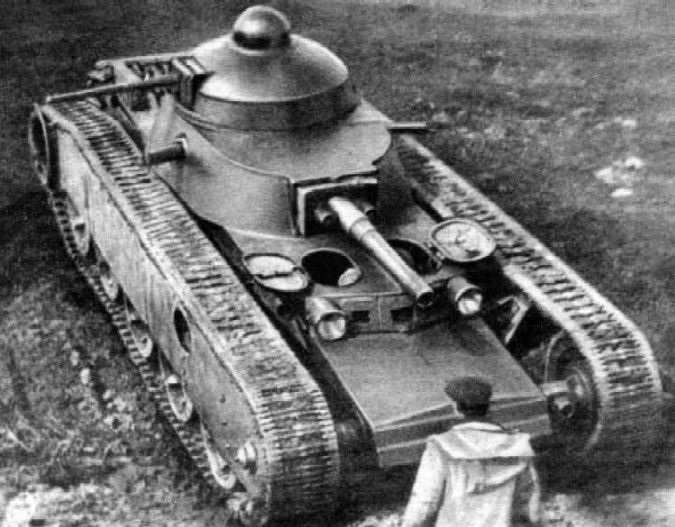 The T-24 prototype was completed in 1931, and permission was given by the VTU to make 24 vehicles. One of the first T-24s was urgently sent to Kubinka for comparative trials with the T-12. Initial trials were conducted, during which performance was found satisfactory, although the prototype’s engine caught fire, and the turret had to be transferred to a T-12 prototype for further testing. The 45 mm gun was not ready for any T-24 tanks, so tests were conducted without them. Having been accepted into service with only a DT, they eventually received guns in 1932. 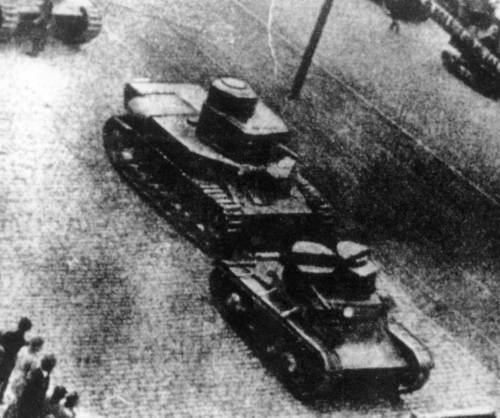 Between 1930 and 1931, 300 more T-24 tanks were planned. In fact, only 24 tanks, 26 turrets, and 28 sets of running gears and transmissions were produced. The T-24 was found unreliable, and was used only for training and parades. After the first 25, production was discontinued. It is believed that the T-24 was withdrawn from the production due to the complexity of manufacturing tanks and a whole host of flaws discovered on the first batch of the tank’s production. The T-24 was also more or less a designing experiment to give engineers experience. Similar experience building projects came from German designer, Grotte, who developed the T-22 or TG-1, which was produced by OKMO in Leningrad, headed by N. Barykov, who later went on to develop the T-28. The TG-1 was much more radical than the T-24 project, and three prototypes were developed. One had a 37 mm (1.46 in) gun with four DT machine guns, another had a 76.2 mm (3 in) gun and four DT machine guns, the final one had a 76.2 mm (3 in) gun, a 37 mm (1.46 in) gun and a single DT machine gun. This tank was huge, as it was 7.5 m long, 3 m wide and 2.8 m high. It had a vast crew of 11, and its 250 hp M-5 engine gave it a speed of 35 km/h. Armor ranged between a very poor 8-20 mm. It was considered horrifically complicated and was refused for production, along with its heavier sibling, the TG-3 (T-29). It would later go on to influence the T-28, T-35, and SMK designs. Finally, all of these designs were rejected in light of complicated production and Soviet access to Christie tanks – more commonly known as the BT series. 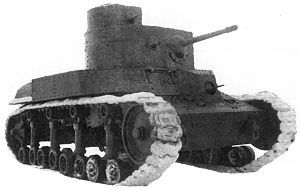 Although the T-24 tank was a failure, it gave the KhPZ its initial tank design and production experience, which was applied much more successfully in adopting production of the U.S. Christie tank as the BT tank series, starting in 1931. The KhPZ’s Komintern artillery tractor was based on the suspension of the T-12 tank (50 built from 1930) and (reportedly), the T-24 (2,000 built from 1935 to 1941), powered by a 131-hp diesel engine. Despite the dismal fate of its predecessor tanks, the tractor was more successful and was put into mass production. The Komintern inherited several of the T-24’s disadvantages, but some of them were fixed by the designers and the others were not as significant for a tractor as for a tank. The Komintern was used to tow medium artillery such as the 152 mm (6 in) gun-howitzer. 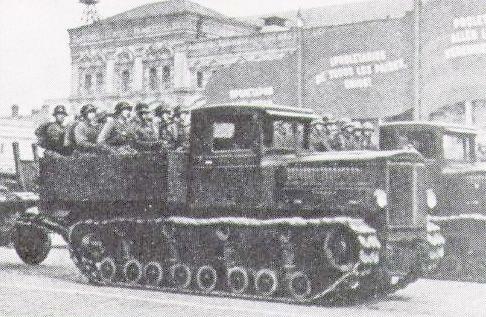 The Voroshilovets heavy artillery tractor was also based on the T-24’s suspension, using the same Model V-2 diesel engine as the BT-7M and T-34 tanks, but detuned. About 230 were built at KhPZ from 1939, and after the German invasion of 1941 production was shifted to the Stalingrad Tractor Factory until August 1942. A Komintern tractor on parade. The T-24’s story did, however, not end in the early 1930s. In 1938, there was a decision to take the at least one T-24 and some T-18s and use them as static pillboxes. The T-24 lost its tall commander’s cupola, but gained the firing system of a T-28 and the co-axial DT was replaced with a Maxim gun. It is unclear whether or not these saw combat, or whether they were ever finally placed as pillboxes. A T-24 tank after preparations for use as a static pillbox. The firing system of a T-28 M1938 has been placed on the front of the turret, along with a Maxim gun instead of a DT. It also has no commander’s cupola, engine, trench-crossing tail, or tracks. The TG-1 prototype with both a 76.2 mm (3 in) gun and a 37 mm (1.46 in) gun. The T-12. Notice the eight-sided turret, the flat rear and the fact the tracks reach the top of the hull. The T-24. Notice the rounded turret, the more elongated rear, the lower track height and the hull sponsons. A T-24 on a parade behind a twin-turreted T-26 Mod. 1931. T-24 technical drawing. Notice how the turret is rounded at the back, as opposed to eight-sided. A technical drawing of the T-24 detailing the interior design, tracks, and suspension. A T-12 outside a factory. A T-12 is posed on by workers and officers. The eight sided turret is very clear in this image. The T-24 is examined by a team of workers and officers. The 45 mm gun was not ready in time for trials, so the tests took place without a gun. very nice to see this unknown tank! This tank is used in Operation Barbarossa in 1941 or other combats ? It was removed from service by then and a couple were prepared to be dug in as bunkers. Didn’t get to that point.